The Friends of Land Between the Lakes received a grant from the Kentucky Colonels to purchase Habitat Earth, a new show for the Golden Pond Planetarium. Narrated by Academy Award-winning actress Frances McDormand and produced by the California Academy of Sciences, Habitat Earth takes viewers on a stunning journey exploring the interconnectedness of life on Planet Earth. The show will debut to the public in 2019. The Golden Pond Planetarium features seven educational shows in the dome daily and is open seven days a week. The Friends of Land Between the Lakes work in partnership with the USDA Forest Service to create opportunities for educational experiences and lasting memories at Land Between the Lakes for tens of thousands of visitors every year. The Friends provide staffing for the Woodlands Nature Station, Golden Pond Planetarium and Visitor Center and the 1850s Homeplace Working Farm. The Kentucky Colonels is an organization of talented and capable men and women appointed by the Governor because of their citizenship and service. Their primary objective is to support Kentucky organizations who stand ready to help our citizens everywhere. The Kentucky Colonels, through their Good Works Program, distributed $2 million to support 231 worthy causes this year, which will impact over 3.8 million people across the state. 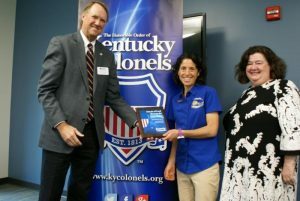 Photo: Kentucky Colonels Board of Trustee General Hal Sullivan presents a plaque and an award certificate to Friends of Land Between the Lakes representatives Aviva Yasgur, executive director, and Jennifer Wheatley, director of sustainability and outreach.